Entries of artistic works will be accepted from any area artist who is 65 years or older. The deadline for entries is March 2, 2018, by 5 p.m. Entries must be delivered to Manor of the Plains, 200 Campus Drive, Dodge City, KS 67801. Entries of artistic works will be accepted from any area artist who is 65 years or older. The deadline for entries is March 7, 2018. Entries must be delivered March 2-3, by 4 p.m. to the Lower Level Activity Room Salina Presbyterian Manor, 2601 East Crawford Street, Salina, KS 67401. Entries of artistic works will be accepted from any area artist who is 65 years or older. The deadline for entries is March 9, 2018. Entries must be delivered to the Jesse Gehman Chapel at Parsons Presbyterian Manor, 3501 Dirr Avenue, Parsons, KS 67357. 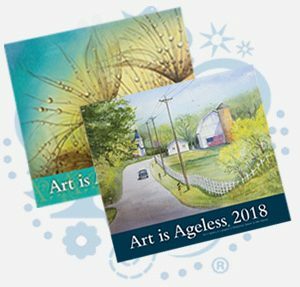 Parson Presbyterian Manor will hold its annual Art is Ageless® exhibit March 12-18, 2018. Entries of artists works are from area artists who are 65 years or older. Local competition winners will be featured in Parson Presbyterian Manor’s newsletter and website, ParsonPresbyterianManor.org, as well as the Art is Ageless website. Entries of artistic works will be accepted from any area artist who is 65 years or older. The deadline for entries is March 14, 2018. Entries must be delivered to the Community Room at Rolla Presbyterian Manor, 1200 Homelife Plaza, Rolla. Click here for more information. Entries of artistic works will be accepted from any area artist who is 65 years or older. The deadline for entries is March 15, 2018. Entries must be delivered to the Commons area at Wichita Presbyterian Manor, 4700 West 13th Street North, Wichita, KS 67212.